Sparkling Summer Sangria | What's Cooking at the Genua's? It’s summertime! Just in case you were living under a rock I thought I’d mention that! And what better to cool off on a hot steamy day than with a pitcher of refreshing Sangria! This recipe is a white sangria and uses my favorite sparkling beverage, Prosecco. Have some friends over and share! 1. 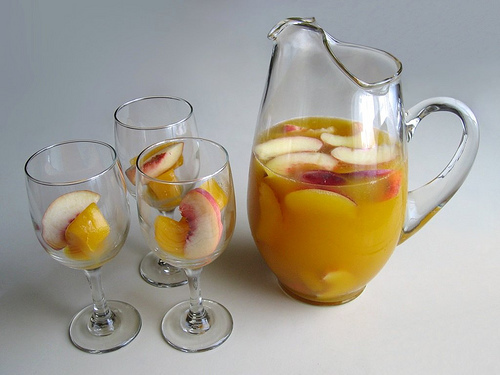 In a large pitcher, combine the peach, nectarine and apricots. 3. After it’s thoroughly chilled stir in the Prosecco and peach nectar. Serve in wine glasses.Garnish with a slice of peach on a decorative toothpick.